Save an additional $300 per couple off this sailing. This deal is combinable with other offers. Expires April 26. Click here for eligible departures. Celebrate the start of your holiday at your luxurious hotel where you will meet your Tour Director for a welcome drink tonight. Enjoy a pleasant morning cruise on the Dordogne River to Libourne. While cruising, perhaps try your hand at a masterclass in French cuisine in Scenic Culinaire. Spend the afternoon in the nearby town of Saint-Émilion, an absolute visual feast and the jewel of this ancient wine growing region. You’ll also get to explore the underground catacombs of the Monolithic Church – a true trip highlight. Freechoice: Enjoy a guided tour of Libourne and view its quaint 16th century town-houses and Gothic church. Alternatively, explore the exquisite estate of Château Franc Mayne and taste its Grand Cru Class wine, or view the eclectic city of Bergerac and enjoy a foie gras tasting at a charming local farm. Discover the remarkable Blaye region today. Freechoice: Stroll through the Citadel of Blaye or take an active walk through the town. Alternatively, join a 30 kilometre roundtrip cycle along the Captain’s Road. You’ll have the opportunity to enjoy a masterclass in Scenic Culinaire or relax as we cruise to Pauillac. Freechoice: This morning, immerse yourself in the scenic Médoc wine region and discover why it is regarded as the world’s leading red wine producer, then sample the region’s finest at Château Gruaud-Larose estate. Or, cycle throughout this beautiful region stopping along the way for a wine tasting. Today, discover the World Heritage-listed city of Bordeaux with its idyllic boulevards and architecture. Freechoice: Shop with a Chef at a local food market before cooking up a storm during your exclusive cooking lesson in Scenic Culinaire. Or enjoy a guided tour of Bordeaux. For the more energetic, cycle the historic regions of Bordeaux, passing the Royal Gate, the Palais Rohan and through public gardens back to the luxury of your 5-star floating hotel. Enjoy a tour of Madrid, including the 17th century Austrian Quarter, the Sabatini Gardens and the Cibeles and Neptuno Fountains. Freechoice: Choose between the exceptional Prado Museum or the equally delightful 18th century Royal Palace of Madrid. French river cruising has never been more elegant or refined than on a cruise through the beautiful Bordeaux region. 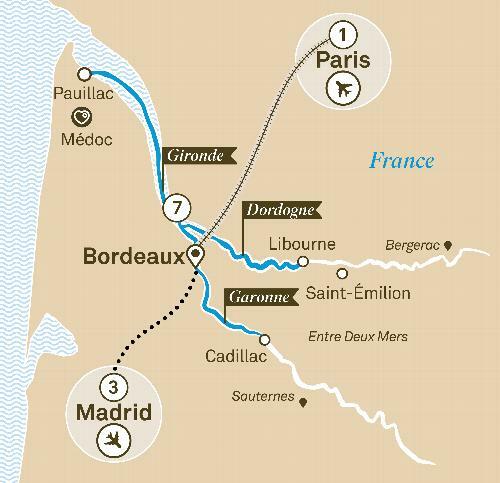 Begin your journey in Paris before embarking on your wonderful cruise through Bordeaux. Sample Grand Cru Class wine, delight in a classical concert in Château Agassac or get lost in the wonder of medieval villages. You can relax on board your Scenic Space-Ship, content in the knowledge that there is sure to be yet another wondrous experience waiting to greet you at the next port.